PRIME minister Narendra Modi said on Sunday (14) that India had called Pakistan’s nuclear bluff in recent cross-border air strikes that almost triggered a new war between the nuclear-armed rivals. Modi and Bharatiya Janata Party (BJP) have made national security the focus of their campaign for a national election now being held. The prime minister told an election rally that an air strike inside Pakistan in February had shown that warnings hostilities could escalate into nuclear conflict were false. “Pakistan has threatened us with nuclear, nuclear, nuclear,” Modi told an election rally in Jammu and Kashmir near the border with Pakistan. “Did we deflate their nuclear threat or not?” he asked the crowd that chanted “Modi, Modi, Modi” in response. India says its fighter jets bombed a suspected militant installation in Pakistan on February 26 to avenge the killing of 40 paramilitaries by a suicide bomber in Indian Kashmir 12 days earlier. Pakistan responded by sending its warplanes toward Indian airspace, leading to a dogfight and the downing of an Indian jet. Military experts have long warned that a conventional armed conflict between the two countries could result in nuclear war and that this was holding them back from a serious showdown. Pakistan has never made a public nuclear threat. But its prime minister Imran Khan did call on both sides to pull back from the brink in February because of the “weapons we have”. Modi renewed his warning to Pakistan that “his new India” is capable of “eliminating terrorists in their homes”. India has long accused Pakistan of supporting militants in Kashmir, a charge its neighbour denies. The suicide bombing was claimed by a Pakistan-based group however. 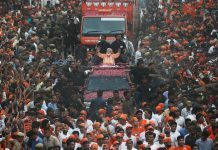 The BJP has sought to use security to lead its election campaign amid a surge of nationalist sentiment since the air strikes. Opposition groups who have questioned the success of the raids have been slammed as “anti-national” by the party. Modi also vowed that India would never give up its claim to Kashmir, which is divided between the two countries, and has been the cause of two wars between the neighbours since their independence in 1947. Tens of thousands of people have been killed in an insurgency in Indian-administered Kashmir since 1989. Modi attacked opposition parties who he said were working to “separate” Kashmir, the country’s only Muslim majority state, from India. The government currently faces widespread opposition in Kashmir to a plan to scrap a constitutional article that gives the Himalayan region a special autonomous status within India. Opposition parties accuse Modi of exploiting turbulence in Kashmir to woo Hindu voters in the election.